1/tie – King Kong (1933) The Original still holds up today, using fantastic stop-motion. 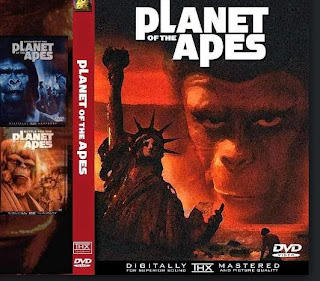 1/tie – Planet of the Apes (1968) The masterpiece is not to be confused with the Burton disaster of 2001. The original 1968 movie was based on the Pierre Boulle novel, and was timeless and thought-provoking. We can watch it over and over again, even today. 2 – Beneath the Planet of the Apes (1970), with the added dimension of underground mutants, this Ape movie really shines. It's a perfect midnight movie candidate. 3 – King Kong (2005) A pretty compelling remake by Peter Jackson, with a great triple T-rex scene fighting the giant gorilla. 4 – Captain Simian and the Space Monkeys (animation) wildly sarcastic and witty. 5 – Dawn of the Planet of the Apes (2014) and Rise of the Planet of the Apes (2011), the new story arc is proving to be very impressive. They tie for fifth place on our list. 6 – Conquest of the Planet of the Apes (1972) part of the original story arc. 7 – Mighty Joe Young (1998) with pretty good ape effects. 9 – Gorillas in the Mist (1988) Sigourney Weaver stars in the true story of Diane Fossey's exploits in Rwanda. 10 – Congo (1995) Average movie with a few good scenes, it closes the bottom of our list. Does anyone remember Clint Eastwood's movie with an Orangutan: “Any Which Way But Loose.” Maybe we give it a small honorable mention. Will the sequels to Dawn of the Planet of the Apes live up to expectations? Time will tell.